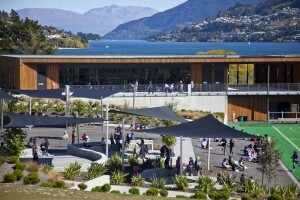 Commissioned by New Zealand’s Ministry of Education (MOE), Remarkables Primary School, is located in Frankton, a small town on the north-eastern shore of Lake Wakatipu, New Zealand’s longest and third largest lake. The site lies above the windswept shore of Lake Wakatipu, close to the Queenstown airport flight path. Approximately half the area of a typical New Zealand primary school site, it experiences a 20m variation in level and limited road frontage for pick-up and drop-off. The MOE held and invitation-only competition to design the new primary school which was won by Babbage Consultants Ltd. The brief was clear and demanded a welcoming school for 460 pupils; learning studio principles; early childhood education centre, ESD to 4-star equivalent; fully acoustically insulated with tight spatial and time constraints addressed. Babbage stated that their design response was to create an efficient two-storey solution that engages with the site’s contours, partially embedding buildings into the hillside and allowing the roof to be utilised for the main entrance and to extend play areas. 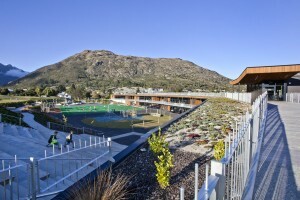 A sculptural winged canopy close to the road marks the entry and furnished decks trail along the school’s roof spaces, interspersed with sweeps of green roof. Warm roof construction provides additional thermal insulation and assists in dissipating aircraft noise to the interior. 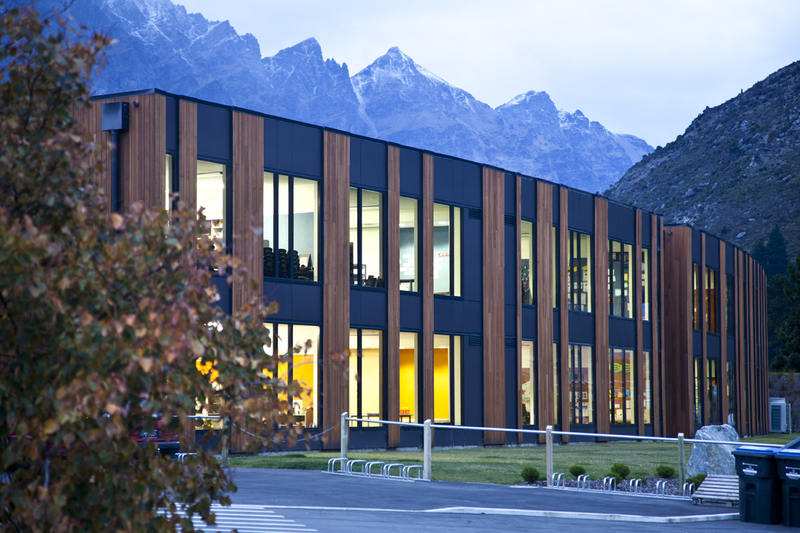 In respect to the Remarkables mountain range from which the school takes its name, it is predominantly clad in natural materials and muted tones, giving it a real sense of belonging to its local environment. This is further enhanced by the lack of strong boundary, allowing school campus to blur into the neighbouring reserve. The lake-side facade is punctuated by stripes of black natura panels and rich cedar cladding, playing against the scheme’s horizontal orientation, as if emerging from the landscape. Arranged in an arc, the structure is shielded against prevailing winds from the lake. This protection allows year-round use of the heart of the school – a series of passive and active outdoor play areas, bordered by an external amphitheatre, inclined to the steep contour by the northern entrance. Overlooking the heart are generous circulation routes that provide shelter and views to the surrounding mountain range. The school’s learning wing is divided into three modular ‘pods’ of classrooms consisting of interlinked spaces, arranged to facilitate current and future pedagogies. 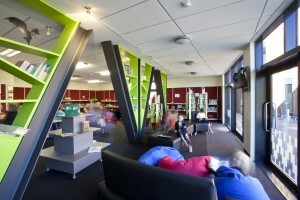 Rooms are light and flexible, designed for multiple learning techniques, with a high level of transparency into the ‘heart’ and large windows over-looking the lake. A bright palette of interior colours and finishes create stimulating classroom environments for both students and staff.